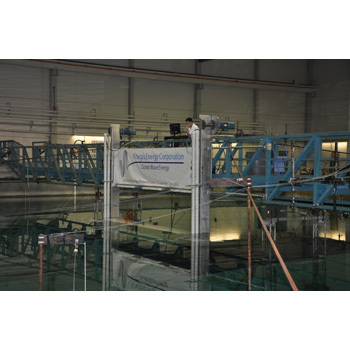 Lift from air- or hydrofoils is used in most of modern energy conversion, like wind turbines, jet engines, ship propellers and others. 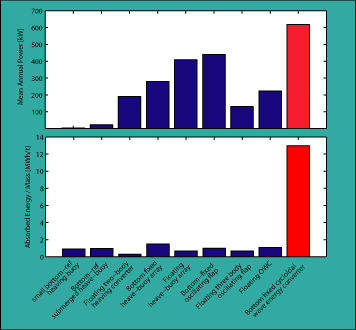 Utilizing lift reduces hydrodynamic losses, and as a result more wave energy is converted to electricity. 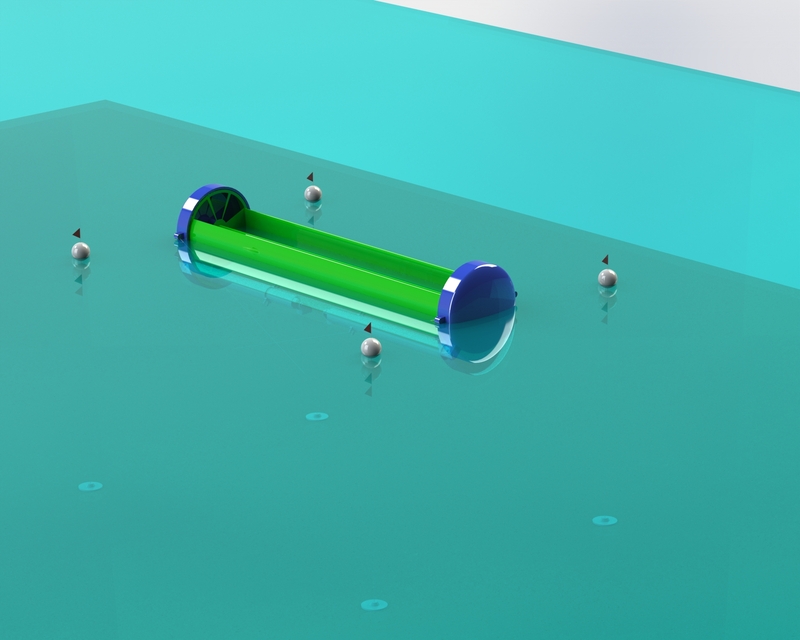 The CycWEC is the only wave energy converter utilizing lift to extract energy from ocean waves. By fully submerging the wave energy converter, it is out of harms way. 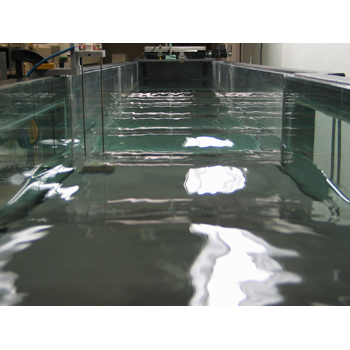 Because of this, it can survive storms, and avoid collisions with ships and floating debris. 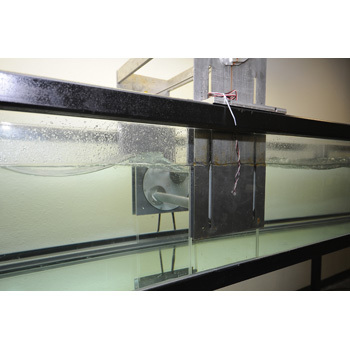 Since submergence reduces the loads due to breaking waves, the cost of building the structure of the device is reduced. 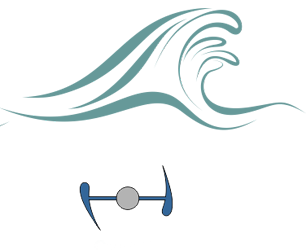 The figure on the left shows how wave energy can be extracted from a harmonic wave, which is shown in blue. The wave travels left-to-right, and if all of its energy has been absorbed, there would be no wave on the right side of the plot any more as shown in green. 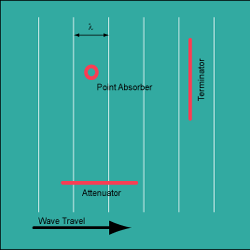 This is the stated goal of wave termination, and if achieved, the wave will end its travel at the wave energy converter, which is located in the center of the plot. In order to achieve this, the WEC actually needs to generate a wave of its own, shown in red. This wave has the same wave length and wave height as the incoming (blue) wave, but is exactly out of phase: When the blue wave features a wave crest, the red wave features a wave trough. The blue and red wave combined lead to the observed green wave shown. The CycWEC achieves this feat by rotating in sync with the incoming wave, so that it performs one revolution with each wave passage. In order to match the wave height, the pitch of the CycWEC blades is adjusted - the larger the wave height, the larger the blade pitch angle. 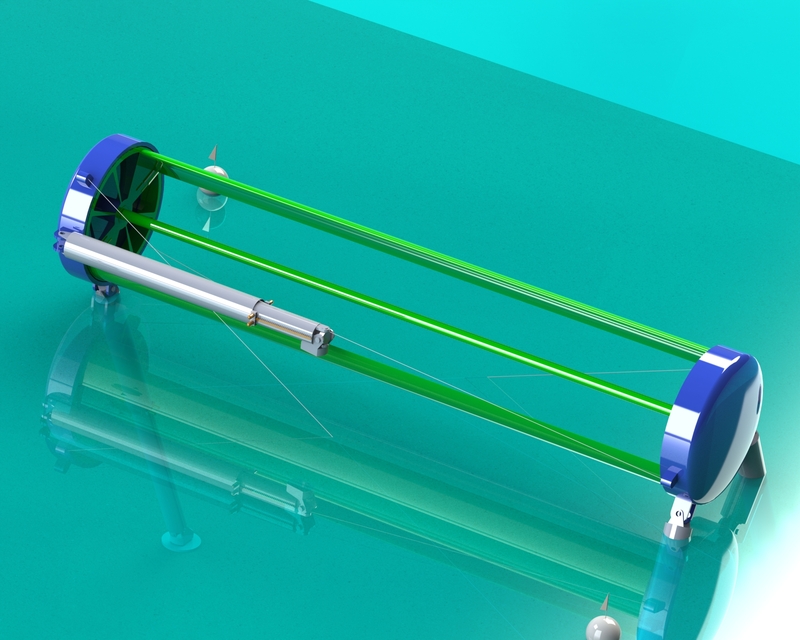 As the incoming wave is cancelled, the CycWEC produces shaft torque which is used by a generator to produce electricity. The blue arrows in the plot show the various velocities that approach the rotating hydrofoil. 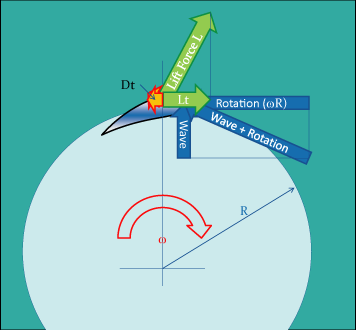 The passing waves cause a velocity in the radial direction (labeled "Wave"), which together with the rotational velocity of the hydrofoil ("Rotation") approach the foil. Due to this combined velocity, the hydrofoil produces lift. 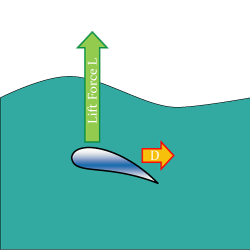 It can be seen that this lift force is angled in the direction of rotation (to the right), and the tangential component of the lift force ("Lt") creates a torque at the main shaft. The plot to the left shows the maximum power that each class of wave energy converter can extract from an ocean wave with a significant height of 2m and wave period of 8s. It is an upper limit that can not be exceeded and was determined using analysis of the waves radiated by each device. An actual wave energy converter would likely only deliver about half of the power as electricity due to viscous losses as well as losses in the power takeoff system. 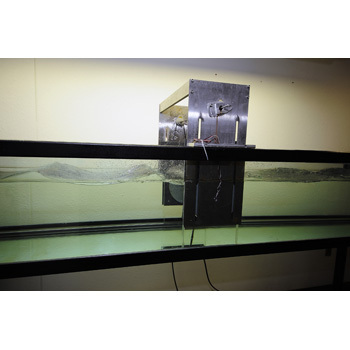 As a result, only the wave Terminator can produce MW scale electric power. For larger sizes it can deliver similar power as modern wind turbines. It is important to note that even as their size is increased, all of the point absorbers can not increase the power extracted. This is caused by waves radiated sideways by these devices, and the numerous failed attempts to develop point absorbers with MW scale output to date support this finding. 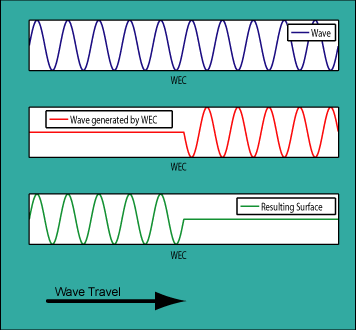 The wave attenuator has a less than proportional increase in power extracted as its length is increased, since it also radiates waves sideways, although to a lesser degree. Only the wave Terminator is able to scale power extraction proportional to its length, which makes large devices cost efficient to construct. 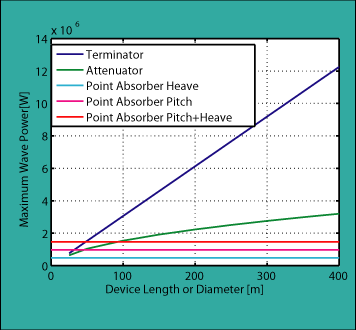 For these reasons Atargis decided to develop a wave Terminator, since there is strong evidence that economies of scale will favor devices with large per-device power output. 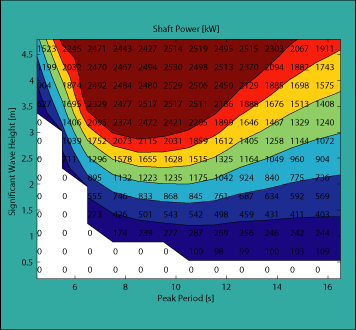 The Atargis proprietary simulation codes, which have been validated with tank experiments, enable us to predict how much power the CycWEC generates for different sea states. This is one of the two key metrics that determine the cost of energy: The more power the device generates, the cheaper the cost of energy will be. 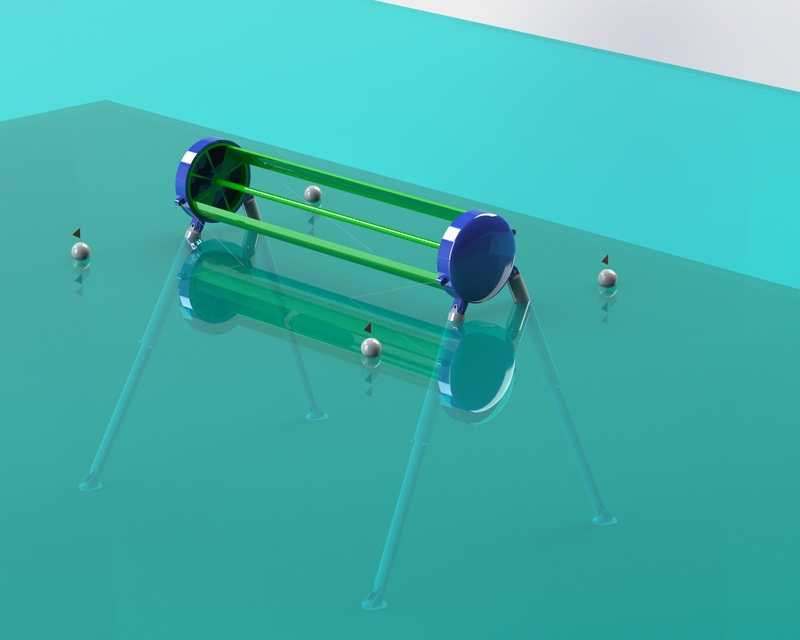 This particular power matrix belongs to a CycWEC design with a diameter of 12m, foil chord length of 5m and foil span of 60m. The total maximum generator power is 2.5MW. The CycWEC is able to produce its design power for a large range of sea states, which indicates high annual power production. 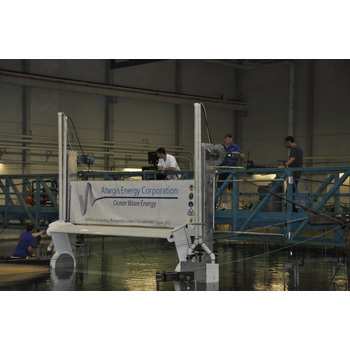 In a wave climate with 30kW/m average annual wave power, for which this design was optimized, the CycWEC converts on average 38% of the wave energy to electricity, and produces about 5.4GWh per year. 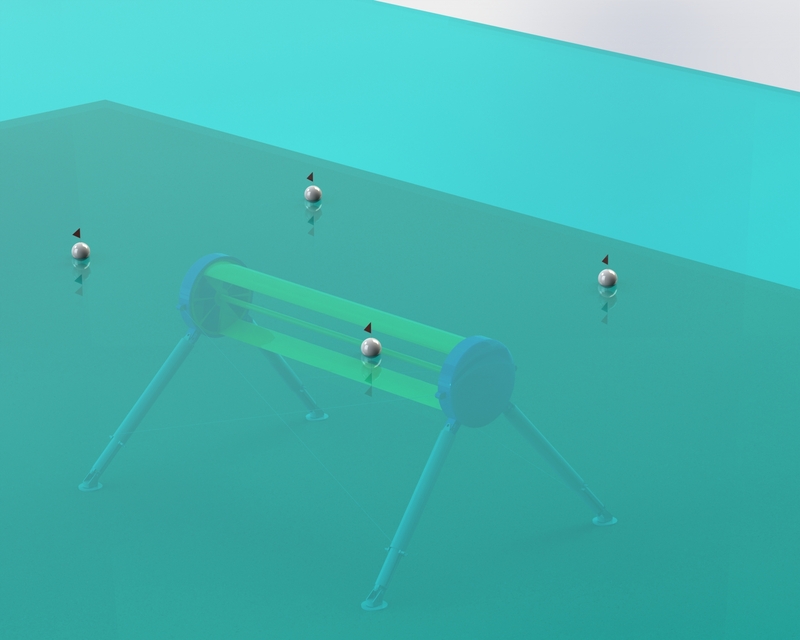 The CycWEC outperforms all other wave energy converters in both metrics, indicating that it will produce energy at a far cheaper cost than the established devices. 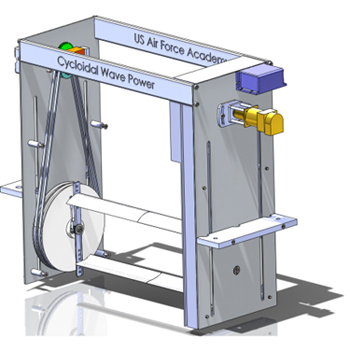 Before Atargis Energy was founded in 2010, Dr. Siegel designed and tested a scale Model of the CycWEC under funding from the National Science Foundation at the US Air Force Academy. 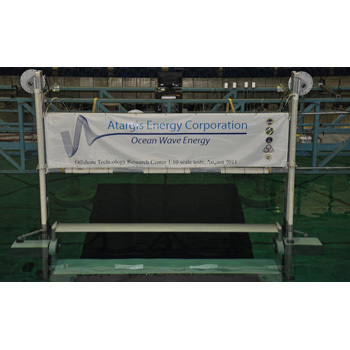 These initial experiments demonstrated the capability of the CycWEC to function as a wave termination device and led to the foundation of Atargis Energy Corporation. 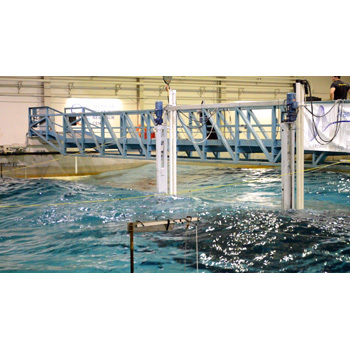 In 2011 and 2012 Atargis Energy conducted two testing campaigns under funding from the Department of Energy at the Texas A&M Offshore Technology Research Center wave basin. 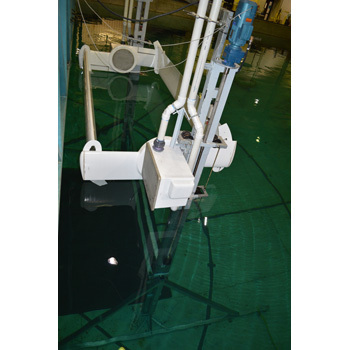 These 1:10 scale tests allowed for the measurement of the power production for the first time and also established the wave radiation pattern of the device. These two key pieces of information enabled the development of advanced numerical simulation codes in subsequent years, which in turn were used to optimize the design and control system of the CycWEC. 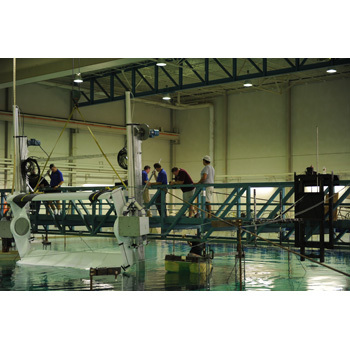 Since the CycWEC uses hydrofoil lift to convert wave power to shaft power and electricity, the existing commercial and academic potential flow solvers and panel codes were not capable of simulating the interaction of the CycWEC with the waves. Thus, Atargis developed its own in-house codes to determine device performance at the model as well as the full scale.These inhouse codes allowed Atargis to optimize the design and performance of the CycWEC. The numerical simultion in the video shows termination of a harmonic wave by the CycWEC. The wave height has been exaggerated for clarity. It can be seen that the wave entering from the left is fully absorbed by the CycWEC. In this particular simulation 99% of the incoming wave power is absorbed by the CycWEC. Based on experimental observations, it became clear that the three dimensional wave radiation pattern of the CycWEC is an important factor in device performance. 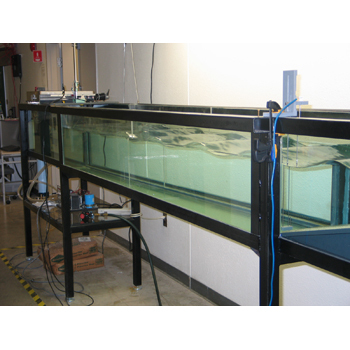 To investigate this, Atargis developed a wave radiation simulation code, that in combination with a control volume analysis, can be used to determine how much wave power is absorbed and radiated away by the device. 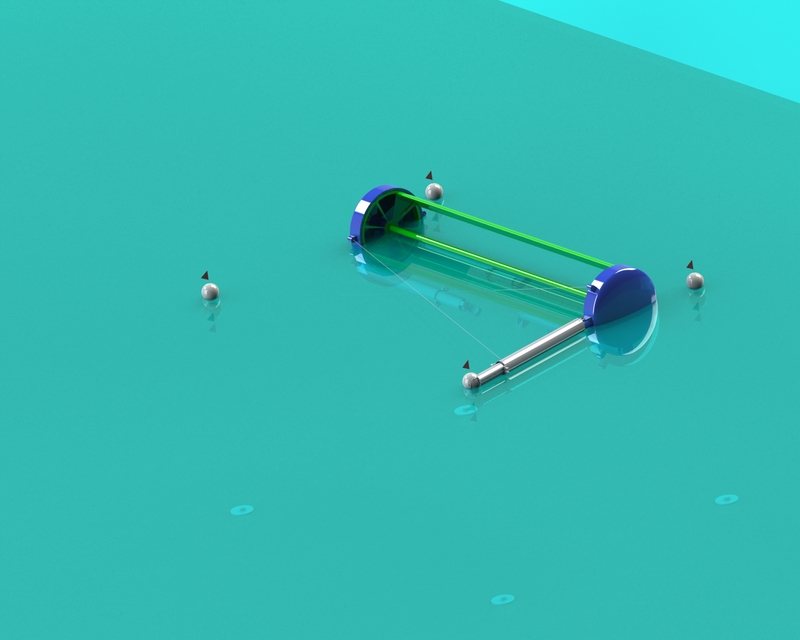 The simulation shown in the video on the left shows how a CycWEC with a span of 1, located at x=y=0, absorbs wave energy from a harmonic wave traveling from left-to-right. Wave crests and troughs are shown in green and blue, respectively. To the right of the device, a wedge-shaped wake with largely reduced wave heights in white can be seen. This indicates that wave energy has been absorbed. 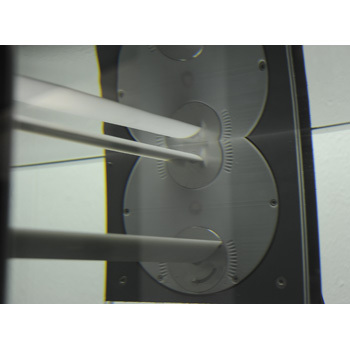 Through a collaboration with Dr. Tiger Jeans at the University of New Brunswick, and his student Chris Caskey, initial CFD simulations with the commercial code Fluent were performed. These have a higher fidelity than the results from the Atargis potential flow solver, since viscous effects are included in the simulation. The results from the CFD simulations were however in good agreement with the potential flow results, validating this approach. Given that the CFD simulations take anywhere from days to weeks to solve on a high performance computing cluster, and the potential flow solver only takes seconds to minutes to simulate the same flow field, Atargis continues using the in house potential flow code for development. Thanks to the CFD simulation validation, Atargis can use the result with a good conscience.